I take refuge until I have awakened in the Buddhas, the Dharma and the Sangha. May all sentient beings abide in equanimity, free of bias, attachment, and anger. Above the crown of your head, the transcendental wisdom of all the Buddhas manifests as White Tara. Her body is in the nature of radiant white light. She has one face and two arms. 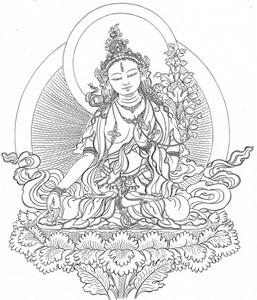 Her right hand is on her right knee in the gesture of granting supreme realizations, and her left hand at her heart holds the stem of an utpala flower. Youthful and beautiful, she is seated in the vajra posture. She has all the signs and marks of a Buddha and has seven eyes (face, palms, soles, third eye). She looks at you and all sentient beings with complete acceptance and compassion. White Tara looks at you and all sentient beings with complete acceptance and compassion. At Tara’s heart is a horizontal white moon disk. At its center is the white syllable TAM, the essence of her enlightened realizations. Light rays shine forth from the TAM and hook back all the life force that has been scattered or lost. This dissolves into the TAM in the form of light. Again light rays radiate from the TAM and hook back the power and inspiration of all the Buddhas, bodhisattvas and those who have attained the realization of long life. This dissolves into the TAM. Also, the essence of the four elements of earth, water, fire and air, as well as the space element, absorb into the TAM in the form of five-colored nectar-light (white, yellow, red, green, blue). From the TAM at her heart, light and nectar now flow into your body. They fill your entire body, dispelling all negative karma, disturbing attitudes, negative emotions, disease, interferences, and dangers of untimely death. All these leave your body in the form of dirty liquid, and your body becomes pure and clear. Your mind too becomes clear and blissful. om tare tuttare ture mama ayur punye jnana pushtim kuru soha. May anyone who merely sees, hears, remembers, touches or talks to me be freed in that very instant from all sufferings and abide in happiness forever. May the glorious spiritual masters live long, and may all beings throughout limitless space be happy. By purifying our defilements and accumulating positive potential, may I and all others be inspired to attain Buddhahood quickly. In order to train just like the hero Manjushri who knows reality as it is and just like Samantabhadra as well, I completely dedicate all this goodness, just as they did. With that dedication which is praised as greatest by all the Buddhas gone to freedom in the three times, I, too, dedicate all my roots of goodness for the attainments of the bodhisattva practice.